One batch of this is way, way more than you need for a batch of the spicy tofu rolls from Marisa Baggett’s Vegetarian Sushi Secrets. However, you should definitely still make a full batch. Because if you’re anything like me, you will find yourself addicted to this amazing curry mayonnaise, and start putting it on everything. Eat it with sushi. Slather it on sandwiches. Dip vegetables in it. The possibilities are endless! As for me, I’m off to go make another batch. Like I said… addicted! Combine all ingredients in a small non-metal bowl and mix to combine. Cover and refrigerate for at least 10 minutes before using to allow the flavors to settle. Sounds delicious. I invented a spicy Sriracha and tamago mayo to top and include in my sushi rolls and this would be a nice change of pace. A_Boleyn – This is a great alternative for Sriracha-based spicy mayos (although I do love those too! ), I highly recommend it! Realy good! 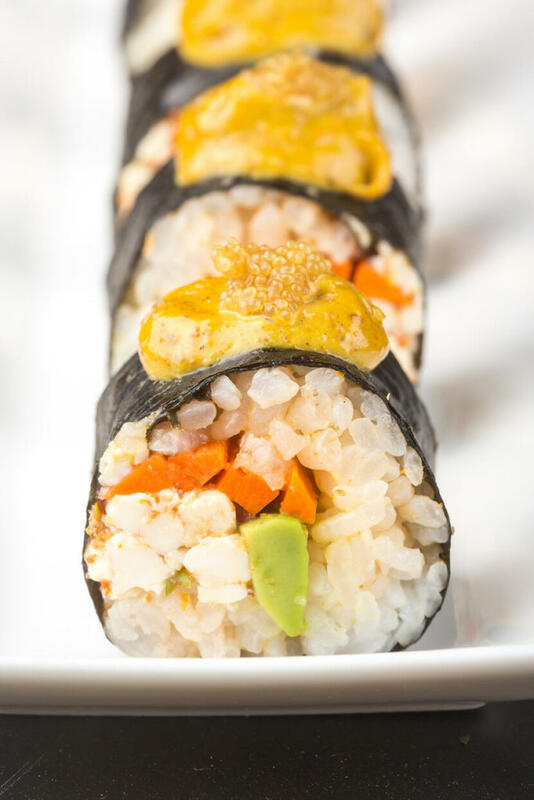 i love sushi and this recipe is perfect! is a mix of my favorite food, mayonnaise and sushi! this is my new sushi favorite of Asian food! Viva el suhi y la comida asiática!